to educate them about Australia's indigenous wildlife. I’m wandering in a large open field, camera in one hand and brown pellets of kangaroo food in the other. Very soon I have the opportunity to use both. Kangaroos roam freely at Bonorong Wildlife Park in Tasmania, and the food is too enticing to avoid the humans who offer it. 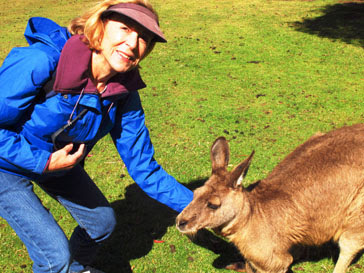 That means I get to practice a new skill: Pet kangaroos under the neck between the front legs, not on top of head. I learn to pet the kangaroo the right way. So I get personal with a couple of marsupials and snap dozens of photos. They get full bellies—buckets of ‘roo food are readily available--before it’s time to escape from human attention and switch places with other kangaroos who have been enjoying peace and quiet in a separate area. 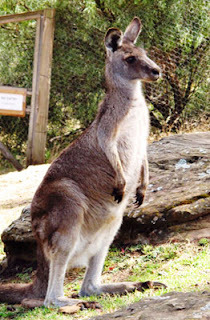 After the kangaroo encounter, I follow an established path around the park, stopping to take pictures of other animals, including many birds, some in cages and others roaming freely. I see wallabies, blue-tongue lizards, wombats, and Tasmanian devils. I stroke the soft fur of a koala bear held by a staff member and try to get a shot of its face. 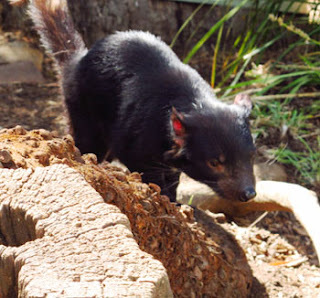 Tasmanian devils, now found in the wild only on this island, scamper around their pen in a frenzy of constant motion. 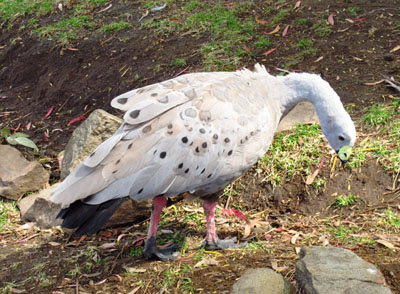 Other devils are sleeping, not unusual since these are nocturnal animals, although it makes them appear docile when they are not. The bite of a Tasmanian devil is very strong—eight times that of a pit bull. Even more, the blood-curdling screams of this carnivorous animal can make your hair stand on end—just as they frightened early settlers. Best advice: Don’t pet! 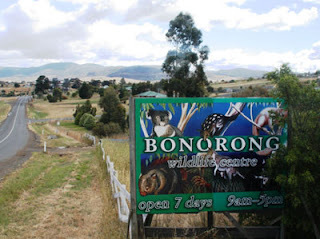 After roaming among the wildlife at Bonorong, we head along into Hobart on Brighton Bypass on the banks of the Jordan River. During its construction, artifacts of trade and stone tools of Aboriginals from 30,000 years ago were found, so the design of the bridge was changed to preserve these artifacts. Although no full-blooded Aborigines remain today, many peoplehere have an Aboriginal heritage. We head to Richmond, a popular tourist destination, where we admire 55 buildings from the Colonial era that were built in the Georgian architecture style dating to the early 1800s—rather plain and stoic with little adornment. The town later became an outpost, with these buildings becoming additional modern-day attractions. 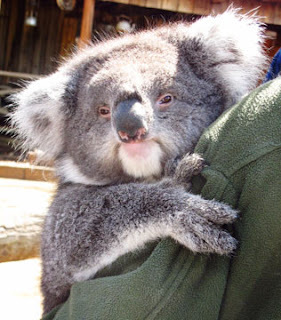 Koalas are cuddly and cute but easily spooked. They can also be quite large. After taking pictures of a bridge built in 1823, the jail (gaol), and St. John’s Catholic Church, the oldest church still in use for services in Australia, we walk across the village green back to town. No wildlife here, but at least I had the Australian experience of petting a koala and a wombat at Bonorong.